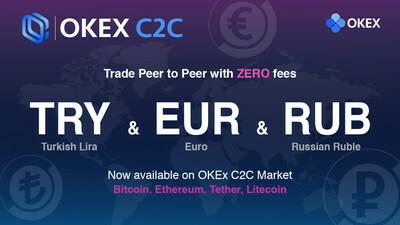 VALLETTA, Malta, April 12, 2019 /PRNewswire/ — OKEx, a Malta-based world-leading digital asset exchange, announced the launch of Euro (EUR), Turkish Lira (TRY), and Russian Ruble (RUB) markets on its C2C fiat-to-token trading platform. In view of the great demand for digital asset trading around the world, OKEx is set to fulfill the role of the trailblazer in driving mass adoption of digital assets globally. Investors in Europe can now enjoy additional options for trading digital assets with fiat currencies. When trading on OKEx, they will be able to enjoy a comprehensive range of trading services, including C2C, spot, margin, and derivatives, with unparalleled convenience and security at one stop. In order to enhance the user experience, OKEx now offers multi-lingual support with currently ten different languages – English, Turkish, Deutsch, Traditional Chinese, Spanish, French, Russian, Thai, Vietnamese and Indonesian – on its website.